All thoughts and opinions are my own, and that is all I have to say on this matter. Peace. I have to admit, I was actively avoiding Christmas songs for this years mini-series, but I have to be frank; what is the winter time without at least one Christmas song thrown into the mix for good measure, and a pretty darned cute on at that? That, and it's a one tracked single, meaning it will be a pretty easy review for one very sleep Chiima on this cold winter's eve. So, there's that. Such a cheat! Seriously though, cheating and sleepiness aside, I am actually looking forward to talking about this release, despite the fact I will only be reviewing one song. It's cute, it's fun, and it certainly gets me in the mood for one of the worlds favourite times of the year! So sit back, relax, and look forward to the lovely charm that is Suzuko Mimori's Merry Merry Christmas! Are you ready for a sweet Christmas treat this Happy Christmas? 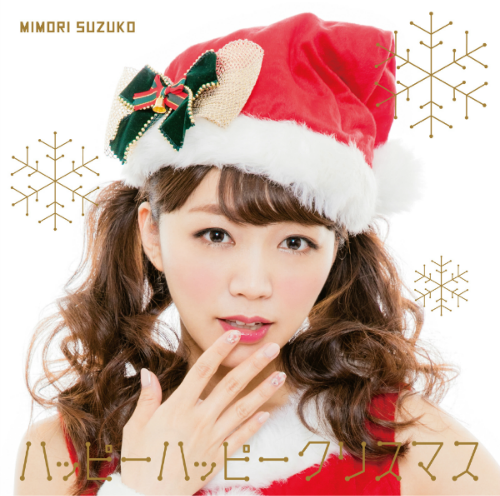 Bringing forth her third 'special release' single, Happy Happy Christmas, voice actress and anime songstress Suzuko Mimori, known for her role as Love Live's! Sonoda Umi, delivers a cute and energetic performance befitting of the Christmas season many celebrate around the world. Fun, flamboyant and certainly festive in tone, this is a Christmas beat that you do not want to miss out on! The single, though only one track long, is your quintessential Christmas song if ever there was one. It's vibrant in tone and chock-full of winter imagery; themes of pine trees, twinkling lights and crisp white snow play in my head when hearing this song, and its all-around cheer is something that you will hear in even the oldest of Christmas jingles from way back when. It's a great song that is befitting of the season, and one that will certainly help you get in the mood for the jolliest of seasons, if you so desire! It's merry and bright, and as a singer, Mimori is pleasant and befitting of the song given. The frivolous tone compliments her vocals wonderfully, and she certainly brings across cheer and passion as well as playfulness for the listeners. She's lively and bright, which is what you want in a Christmas song as bubbly as this, and in each line she sings, you can hear how Mimori truly captures the essence of Christmas cheer and joy in this wonderful song! What more is there to say other than that this is a wonderful track, and one that is a great addition to the ever-growing archive of Christmas singles that are already out there? It's a great jingle that is twinkling in tone and rich in warmth, and though it is one of the newer tracks I have heard this year, it is already becoming a song that I like quite a lot. Then again, I am kind of a sucker for the more Christmas-y of tracks, especially ones as cheerful and bright as this. Overall, it's great, though it would have been great to see a second track accompanying this song. Aside from that though, I rather like this song, and can only see myself liking or loving it more over the next few days as I prepare for my looming essay deadlines and Christmas itself. As I've said before, I'm a sucker for these types of songs, so I will give this single a 4 out of 5 stars, only because it lacks a second song, but also because it warms my little heart during this time of the year. It's a positive tune for me as I write my essays, and it certainly gives me something to dance along to when I want to have a merry jig. What can I say? I like what I like, and this is what I like. Until next time, please keep warm, happy, healthy, and always love Idols and music! Mwah! Wa~! Happy, Jolly, Merry Christmas!! !